The Allen County Engineer’s Office is responsible for the maintenance of Allen County’s local highway system, which includes 352 miles of county roads and 550 miles of township roads. The County Engineer is also responsible for the inspection, maintenance and replacement of 378 bridges and over 1,400 culverts of various sizes located throughout the county. To maintain this complex system, the County Engineer works in cooperation with the 12 townships to help perform roadside mowing, snow plowing, drainage improvements and road maintenance. 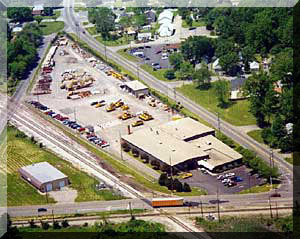 The main office for the County Engineer is at the Allen County Garage, which is located at the corner of Robb Avenue and Sugar Street. This garage was erected in 1947 and sits on 9 acres located on the east side of Lima, about 1 mile west of Interstate 75. The garage has 24,000 square feet of floor space for housing 18 snow plows, 2 mechanics bays, traffic sign shop and a bridge material area, along with superintendents offices, locker rooms and an employee break room. The Allen County Engineer’s Office maintains approximately 60 vehicles varying from staff vehicles to heavy construction equipment. All maintenance on vehicles is done in-house except for specialty maintenance such as vehicle painting. The office, which was remodeled and enlarged in 1984, covers 10,000 square feet and houses the engineering design staff, surveying, ditch maintenance, inspection and the Allen County Engineer’s office. The Tax Map Office, which is an extension of the office is located on the second floor of the Allen County Courthouse.